RICHMOND, VA.- The Virginia Museum of Fine Arts has appointed Dr. Geza von Habsburg as guest curator of its Lillian Thomas Pratt Collection of Russian Imperial Jewels by Peter Carl Fabergé. Von Habsburg is an internationally known author and authority on Fabergé. 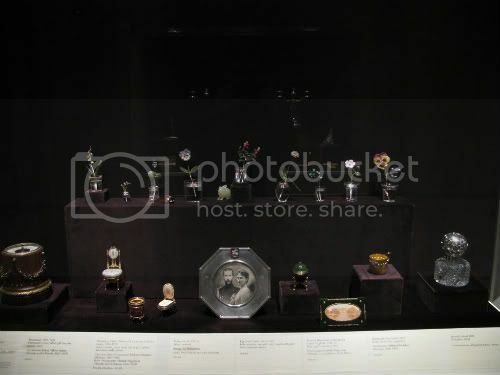 He has been curator and organizer for a number of Fabergé exhibitions in the United States and abroad, among them "Fabergé, Jeweler to the Tsars" (1986-87) at Kunsthalle der Hypo-Kulturstiftung in Munich, Germany, and "Fabergé in America," which was shown at VMFA and four other U.S. cities (1996-97). He was chief curator of the exhibition "Fabergé, Imperial Court Jeweler," which was shown in St. Petersburg, Paris and London (1993-94). He has also written or co-written nine books on Fabergé and related topics, among them "Fabergé: Imperial Craftsman and His World," published in 2000. "We are delighted to have Dr. von Habsburg in this key position at VMFA," says VMFA Director Alex Nyerges. "Our Fabergé collection is one of the most important in the world, and someone of his authority and expertise as guest curator will add greatly to our understanding of the work of this significant artist." The Virginia Museum of Fine Arts' Pratt collection includes the largest public assemblage of Fabergé imperial Easter eggs outside Russia. The full Pratt collection numbers approximately 150 creations from the Fabergé workshops. As guest curator at VMFA, von Habsburg will examine and catalog the collection in anticipation of a major exhibition and accompanying publication. The exhibition, "Fabergé Revealed," will be on view at VMFA beginning July 9, 2011, in the new special exhibition galleries of the James W. and Frances G. McGlothlin Wing, opening in May. The exhibition will be shown only in Richmond. For the first time, the exhibition will present the entire VMFA collection of Fabergé works and associated items alongside a number of key loans from prominent international collectors. A publication will catalog the entire VMFA Fabergé collection and will include a series of essays by von Habsburg and other international scholars. Following the closing of "Fabergé Revealed," von Habsburg will oversee the reinstallation of the collection in an enlarged and redesigned permanent gallery. Von Habsburg is the grandson of King Frederick Augustus III of Saxony and the great-great-grandson of Emperor Franz-Joseph of Austria. Born in Budapest in 1940, he attended universities in Fribourg and Berne, Switzerland; Munich, Germany; and Florence, Italy. He earned a doctoral degree from the University of Fribourg in 1965. He is curatorial director of the London-based Fabergé Company. 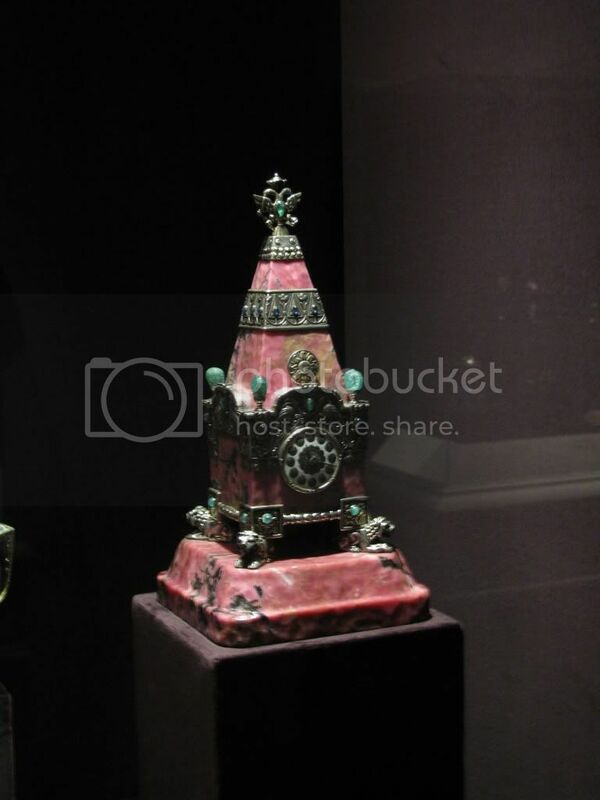 VMFA's Lillian Thomas Pratt Collection of Russian Imperial Jewels by Peter Carl Fabergé was formed between 1933 and 1946 by Lillian Thomas Pratt of Fredericksburg, Va., the wife of General Motors executive John Lee Pratt. In 1947 she bequeathed several hundred pieces of Russian art, many from the Fabergé workshops, to VMFA. Fabergé, born the son of a jeweler in St. Petersburg in 1846, was named goldsmith and jeweler to the Russian court in the mid-1880s. In 1885, Czar Alexander III proposed to Fabergé the creation of an elaborate Easter egg to be presented to the czarina. Such special eggs became an Easter tradition throughout Alexander's reign and that of his son and successor, Nicholas II. Fifty imperial eggs are known to have been fashioned before the fall of the house of Romanov in 1917. Five, all from Nicholas' reign, are in the Pratt collection. They are the Revolving Miniatures Egg (1896), the Pelican Egg (1897), the Peter the Great Egg (1903), the Czarevitch Egg (1912) and the Red Cross Egg (1915). Fabergé fled Russia in 1918, after his firm was closed by the Bolsheviks. He died in Lausanne, Switzerland, in 1920. 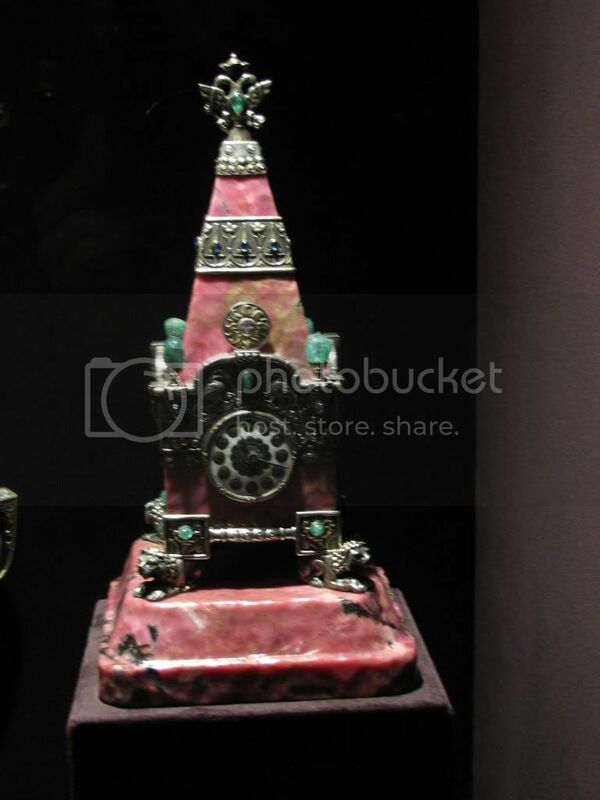 In 1989 I went to San Diego, CA to see 26 of the Faberge eggs. What really amazed me was the small size of many of them. Quite a lot of them are the size of an actual hens egg. 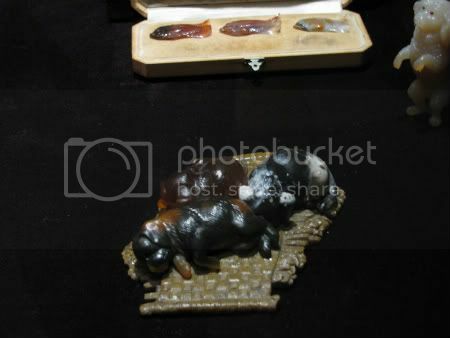 I did wish that the curator had displayed them with more attention to detail, as they were very dusty. 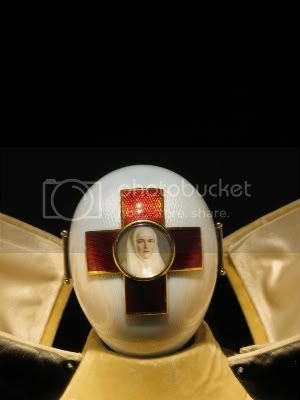 This egg, the Catherine The Great Egg of 1914, is 4 1/2 inches high. It truely is a wonder. 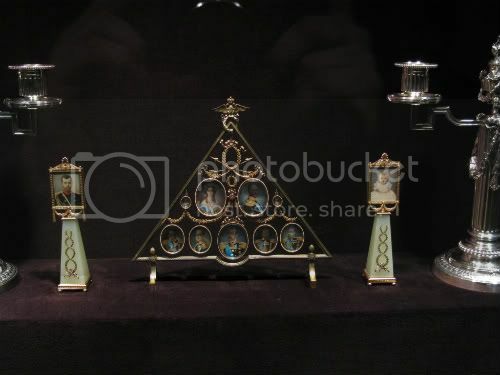 Here are some Fabergé pieces in the Cleveland Museum. I took the pictures myself, so I apologize for some of the quality. Picture frame (sorry, I can't remember who the picture is of, but I'm sure some of the Romanov buffs know). Two shots of the Kremlin Clock. I believe this used to be in Nicholas II's bathroom in the Alexander Palace. For those who have an interest in interesting pieces of Faberge, please note that a Special Exhibition (of Faberge) will be held at the Summer Opening of Buckingham Palace, 23 July - 3rd October. Among the pieces will be one with an association of names that most of the posters here on the APTMF will recognize. 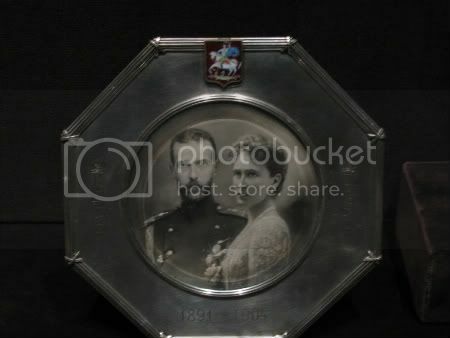 Quoting from the item's description given for the Exhibition (given and shown on the "Glittering Royal Events Message Board's, "Royal Jewels of the World"/Exhibition Microsite Link") : "Inkwell / before 1896 / Anders Nevalainen / Presented to Princess Elizabeth and Lt. Phillip Mountbatten / On the occasion of their wedding on 20 November, 1947, the Queen (then Princess Elizabeth) and the Duke of Edinburgh received two presents of works by Faberge including this rock crystal inkwell from Baroness Sophie Buxhoeveden. She had been Tsariana Alexandra's favourite Lady in Waiting. After her escape from Russia, she eventually came to live in London, in a Grace and Favour apartment at Kensington Palace, serving unoffically as the Dowager Marchioness of Milford Haven's Lady in Waiting. The lid of the inkwell is set with a Catherine the Great rouble enamelled in red with gadrooned silver mounts." 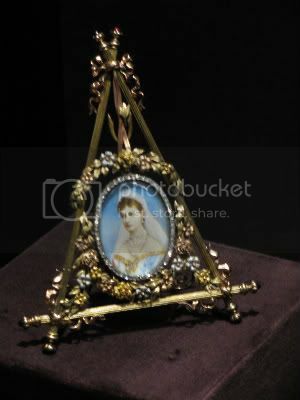 The Royal Collection's inventory number ifor this item is : RCIN 49631. AP. Amongst the exhibits are going to be several more additions bought by the Queen and Prince Charles showing the collection is still growing! Yes, you are quite correct. 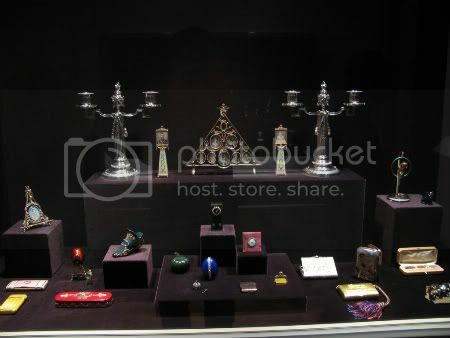 If it is not THE largest ("private") collection of Faberge in the world, it is certainly ONE of the larger. Regards, AP. There's a wonderfull exhibition at present on Fabergé items and eggs at the Salone di Raffaello of the Pinacoteca of the Vatican Museum. Re Post # 57: Thank you, "lilianna," for the film clip. It is VERY interesting (and for me, the FIRST time) to see at 02:24, the "Renaissance (Casket) Egg" AND its supposedly long-lost "surprise" ("The Resurrection Egg") united in display as such! This discovery was earlier made by one of the Forbes' sons and since they owned BOTH the items at that time, it was easy to demonstrate his hypothesis. I understand that the "Resurrection Egg" fits EXACTLY within the "Renaissance Egg, with no movement. While there are no pearls on the "Renaissance Egg" per se, I understand that the surprise was mentioned in records as having pearl decoration, which it does! 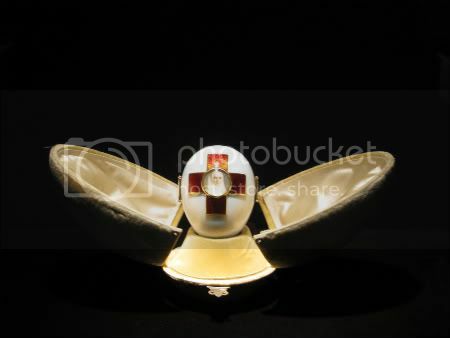 Since I presently do not know the extent of any potential universal agreement among the Faberge experts around the world, I have not heard of any discussion/decision to "de-classify" the "Resurrection Egg" as a "stand-alone" egg in its own right, thereby diminishing the individual "Imperial Egg" count by one. Regardless, it is a wonderful work of art, and when placed within the translucent casket-egg, I understand that the Risen Figure is almost "mystically" visible! Regards, AP.